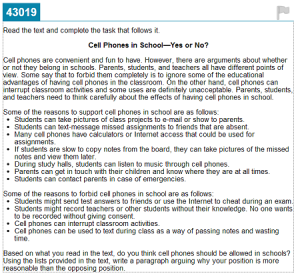 The item above comes from a sample item on the SBAC (Smarter Balanced Assessment Consortium) website, and it’s supposed to assess the writing of an argument (what used to be called persuasive writing). Click on the image to get a larger view to read the task. I’m sharing this because this week I administered a similar writing task at my site recently. Students were given a sheet of facts and statistics, and a sheet of arguments for the two positions they had to choose from, to write a 5 paragraph essay. When we were previewing the tasks, it seemed questionable to give students a list of “arguments” since this would make this a much lower-level cognitive task, and not require any analysis on the part of students. When you look at this type of task, you have to wonder why they would do things this way, and how they could insist that these tasks are at a “higher” cognitive level and more demanding than past writing prompts. Of course, in the past writing was only assessed at a state level in 4th and 7th grade in California, and now we’re including it every year in tests. I know, I know, teachers in classrooms, and many sites, were doing summative writing assessments, but there’s a difference. Common Core wants to do whole-scale standardized assessments of writing. There are some drawbacks to that. It’s time-consuming, and it’s expensive, but not if you figure out a way to continue to machine/computer grade essays and writing, just as current multiple-choice tests are done. It would explain much about why the standards have been structured the way they were, and why some of the tasks we’re seeing are the way they are, but it also ensures that what we’re asking students to do will be so constrained by the parameters of the testing environment that they will be useless to judge authentic student learning. There has been talk about computer grading of these assessments, including writing, since they were first being developed. This piece that appeared in the NY Times a while back talks about some of the limitations of robo-readers, but Tom Hoffman gives a delightful example of the shortcoming here, Computer Scoring Open Ended History Questions – Tuttle SVC. Basically, the programs can judge grammar and usage errors (although I suspect it will lead to a very stilted form of writing that only a computer could love), but it’s not in the position to judge the facts and assertions, or content in an essay. The only way to do that is to limit students to what “facts” they are using by giving them a list. It would also explain the love for a certain type of closed-reading instruction in Common Core, and the hostility to background knowledge and information, that’s written about in this piece by Paul Horton: Common Core and the Gettysburg Address – Living in Dialogue – Education Week Teacher. Even if my assertion that the standards were written to accommodate testing, and more specifically machine scoring of writing are wrong, these are still lousy tasks that are very low-level and not “rigorous” or cognitively demanding. Thanks for raising this flag, Alice. Too many people are just parroting the corporate fiction that these tests are somehow looking for critical thinking, when in fact they suffocate it. Wonderful. Thank you for your post. While the whole CCSS deal is an uphill battle it’s great to stumble in for a moment of Mercer wit…simultaneously informative and entertaining! I love your humor!